View of face of Craw Stane Pictish symbol stone. 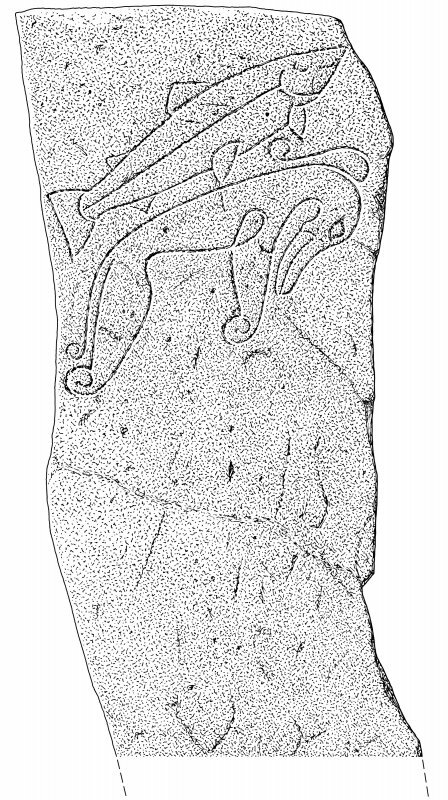 Digital image of the 'Craw Stane', Rhynie, from J Stuart, The Sculptured Stones of Scotland, i, pl.6. 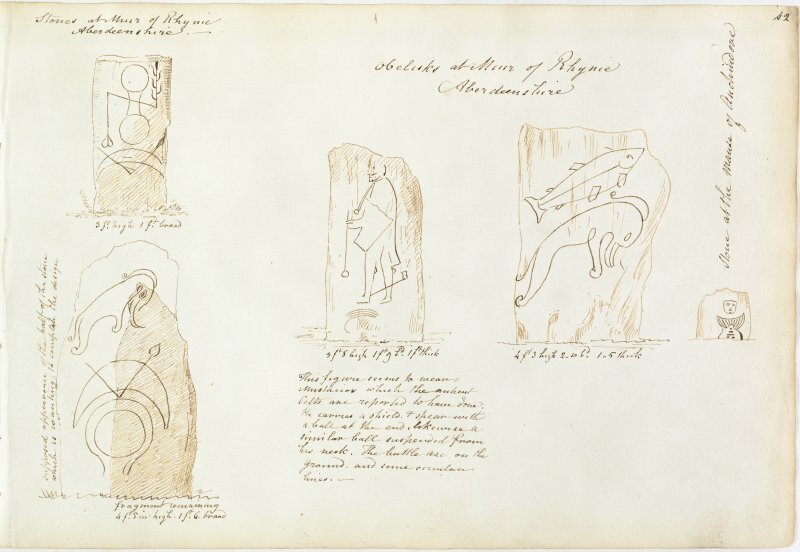 Drawing of carved stones, Rhynie. 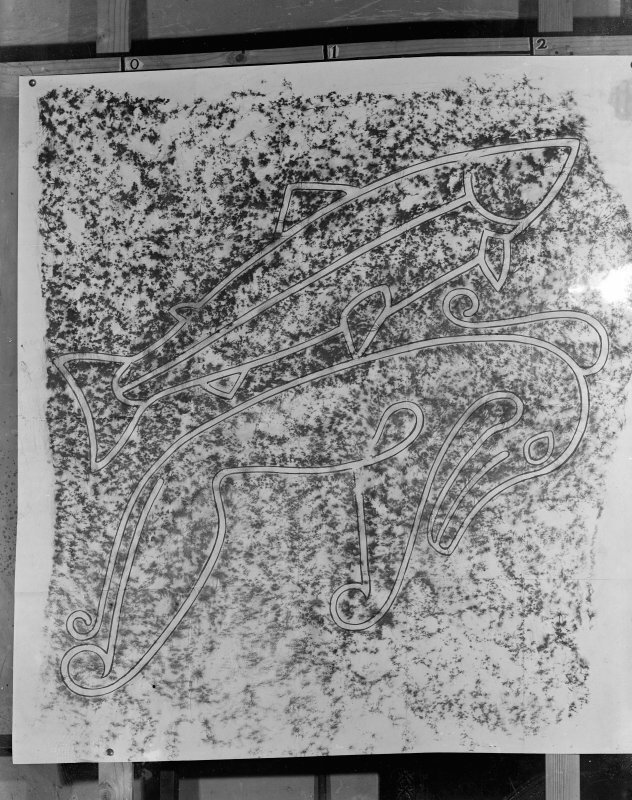 Photographic copy of rubbing showing face detail of the Craw Stane Pictish symbol stone, Rhynie. Oblique aerial view of Rhynie, Craw Stone centred on a Pictish symbol stone, taken from the W.
Oblique aerial view of Rhyne, Craw Stone centred on a Pictish symbol stone with cairn adjacent, taken from the SE. 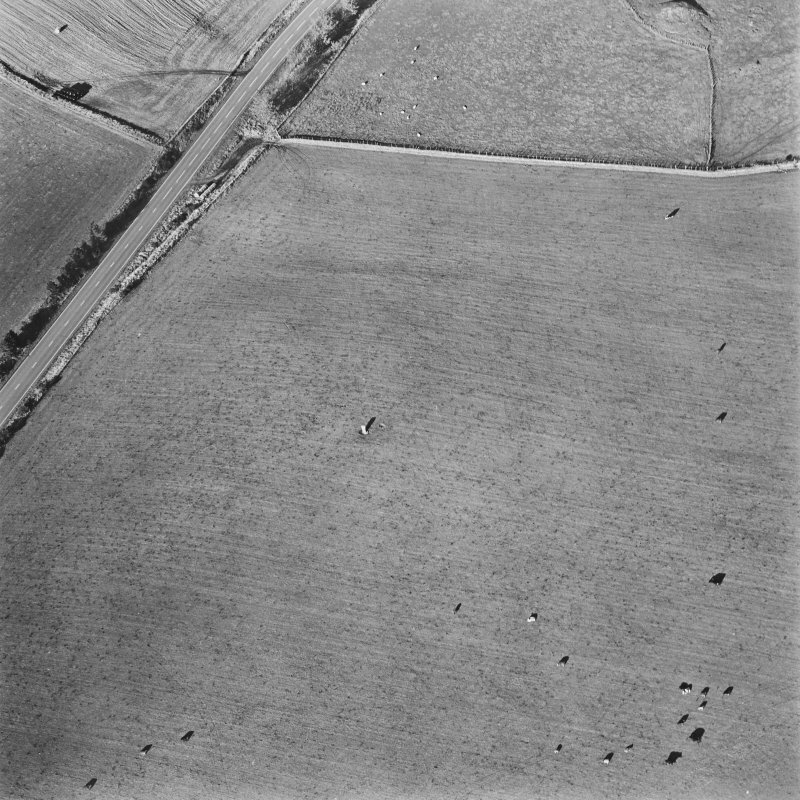 Oblique aerial view of Rhynie, Craw Stone centred on a Pictish symbol stone, taken from the S.
Drawing of four stones from album, page 42. Digital image of ABD/501/1/P. 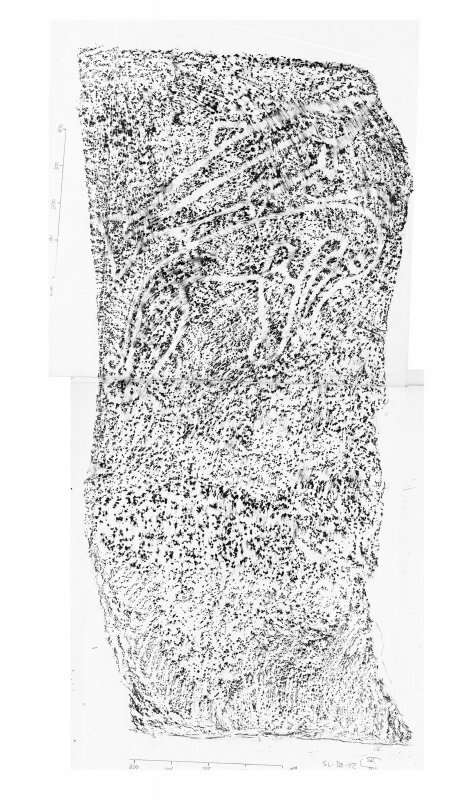 Rhynie, Craw stone, composite digital image of rubbing of Pictish symbol stone. Evidence for discovery: recorded in the 1850s in a field to the south-west of the old kirkyard, later set in a concrete base. 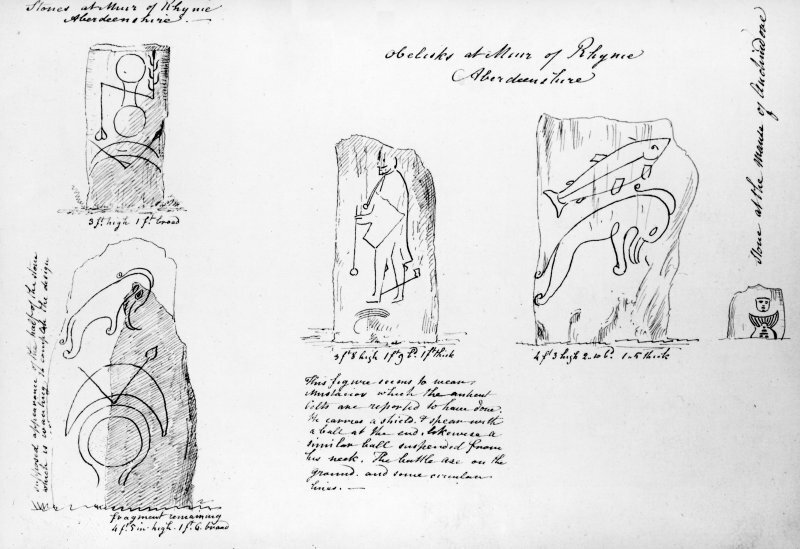 One broad face is incised with the fish symbol above the Pictish beast symbol..
References: Stuart 1856, 4; Fraser 2008, no 43.1. See also NJ42NE 30 and NJ42NE 54. The Craw, Cro or Crow Stane is a block of grey granite, 5'7" high, 3' wide and 1'6" thick, with the symbols of a fish and elephant. J R Allen and Anderson J 1903; J Stuart 1856. The Craw Stane as described and illustrated. Visited by OS (NKB) 5 October 1967. This sculptured stone is situated on a S-facing slope just below the crest of a hill in a pasture field at an altitude of 210m OD. It has been concreted around the base. The symbols are grooved, pecked and still very clear, while a vegetation mark indicates the possible former presence of a cairn about 0.7m above the base. Visited by GRC/AAS, 18 October 1977. The Craw Stane stands in an arable field, just below the crest of a low hill which overlooks the valley of the Water of Bogie to the E. It is a roughly rectangular block of grey granite, measuring 0.9m in breadth by 0.4m in thickness at ground level and 1.85m in height, set in a concrete base. 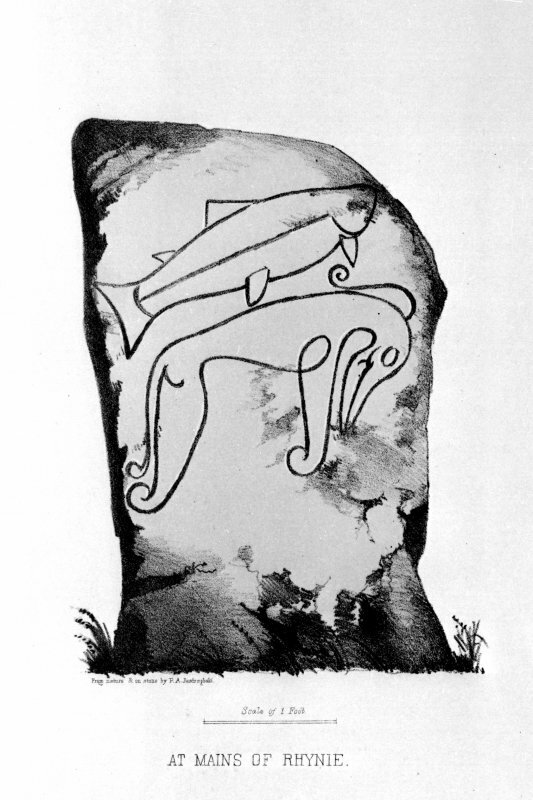 Its SW face bears the incised figure of a fish and, immediately below it, a Pictish beast. Visited by RCAHMS (IF, ARG), 20 September 1996. 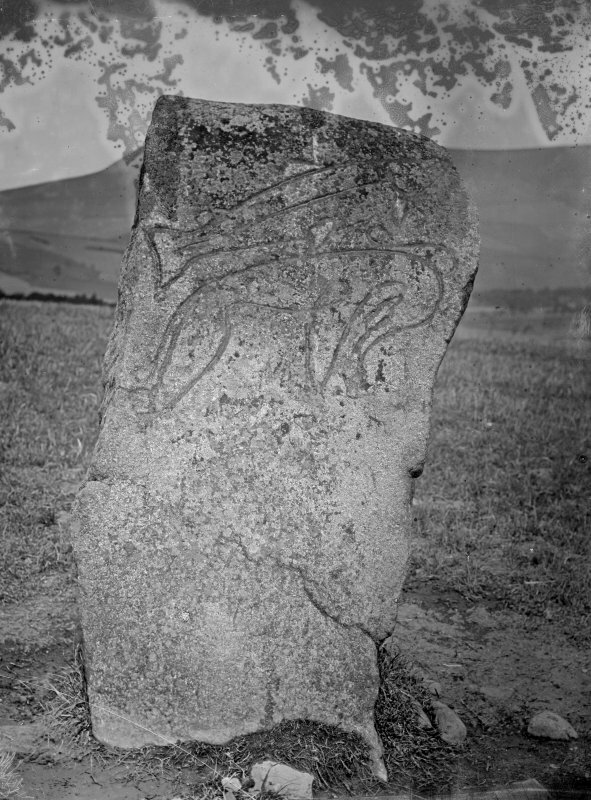 Class I symbol stone, Rhynie 1. On the S face is a salmon above an elephant . NJ 4974 2634 (centre) A magnetometer survey of the area surrounding the Craw Stane was undertaken in June 2005 as part of the Rhynie Environs Archaeological Project. The survey covered the Scheduled area of the Craw Stane and a series of surrounding enclosures. 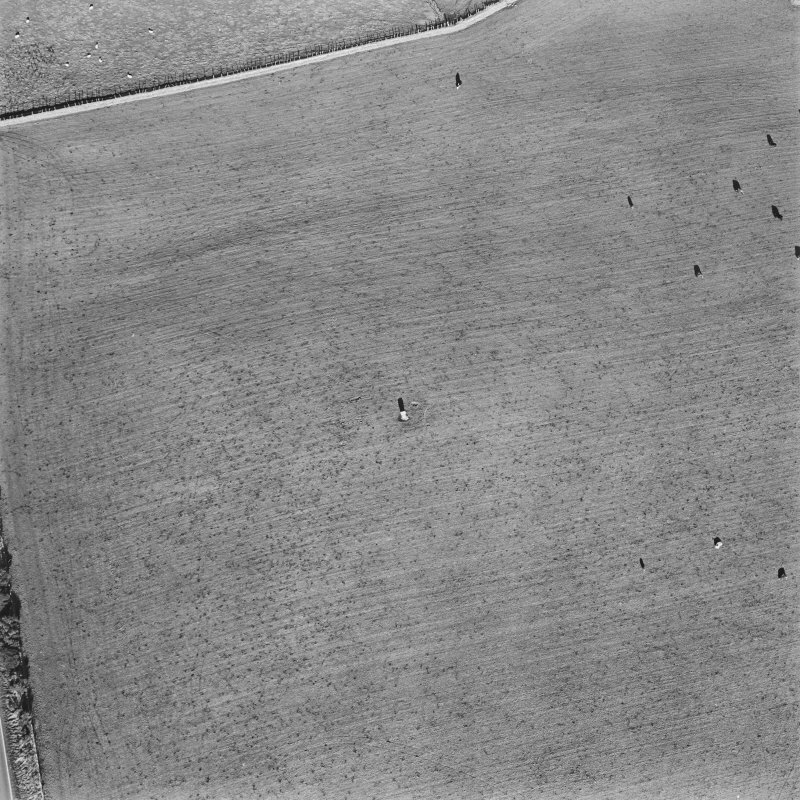 The survey clarified the nature of the three enclosures identified by aerial photographs around the Craw Stane, two of which are probably ditched, while the other is palisaded, enclosing a total area of c 60 x 50m. The ditched enclosures appear to have entrances to the E. The Craw Stane lies between the two ditches at the southern side of the entrance area. A series of features was also identified within these enclosures. Two large sub-circular anomalies were also detected, 60m to the N and 90m to the NE of the Craw Stane; these produced very high readings. Surrounding these are possible traces of a large rectangular enclosure (c 50 x 90m), aligned NE-SW, which encloses the area of the two sub-circular anomalies. One of the sub-circular anomalies was targeted for excavation. Additional grids adjacent to the cemetery of the old parish church showed a linear anomaly to the W of the churchyard. Report lodged with Aberdeenshire SMR and NMRS. Trust for the Universities of Scotland. NJ 4974 2634 A resistivity survey was undertaken from 6-11 November 2006 as part of the Rhynie Environs Archaeological Project (REAP). The survey covered the scheduled area of the Craw Stane and a series of surrounding enclosures (Barflat). The survey clarified the nature of the multiple enclosures around the Craw Stane and identified a further possible ditch with entrance on the southern edge of the complex. A series of features were also visible within these enclosures. To the S of the Craw Stane enclosures, a strong circular feature c10m in diameter, with an internal feature and a possible entrance to the SE was identified. Linear features were also present (possibly field drains or boundaries), as well as other less well defined features. Archive to be deposited with RCAHMS and reports with Aberdeenshire SMR. Funder: The Society for Medieval Archaeology and The Hunter Trust with support from the University of Chester and the University of Glasgow. Meggen Gondek and Gordon Noble, 2007. 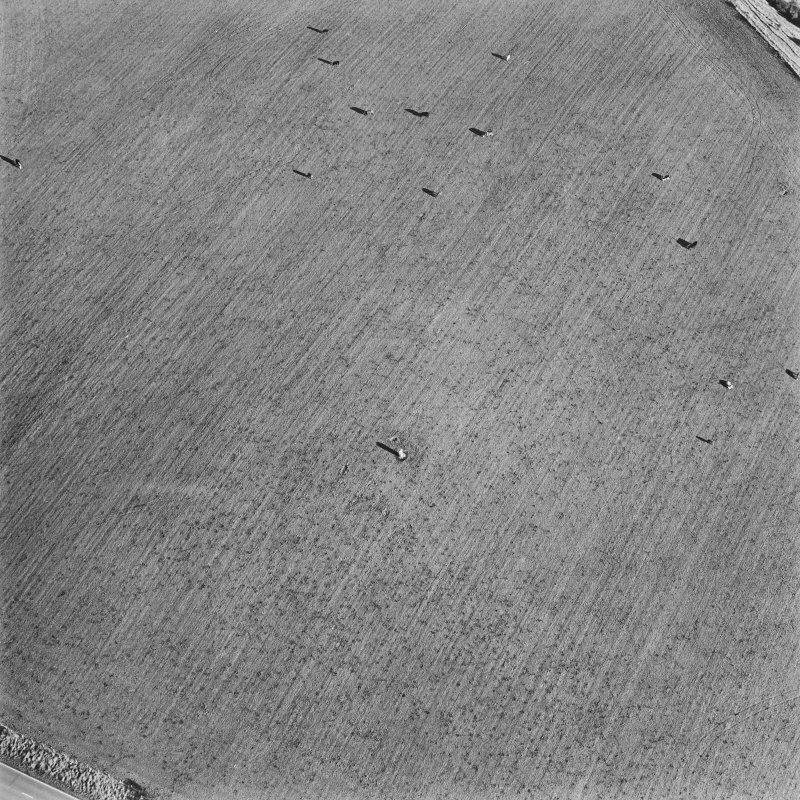 NJ 49749 26345 An evaluative excavation over cropmarks and geophysical results at Rhynie was undertaken 7–21 April 2011. The work revealed a series of concentric enclosures centred on a ring ditch and other possible timber structures, and in association with the Class I symbol stone, the Craw Stane. The enclosure features included an inner ditch, an outer ditch, a circular setting of large postholes and a palisade trench. The site experienced at least one significant destruction phase and several of the features showed evidence of burning in situ. Near the Craw Stane, evidence of a rectangular structure, possibly a building, was found including post and beam settings and potential floor layers. Other features included a range of pits and postholes. Artefacts included sherds from probably two different types of imported Late Roman Amphorae of 6th-century date, a fragment of 6th-century continental glass, metalwork, metalworking debris and amber beads. This phase of evaluative work strongly suggests that the Craw Stane and two other symbol stones nearby were associated with a high status 6th-century settlement, but only detailed post-excavation and further phases of fieldwork will elucidate the full sequence. NJ 4974 2634 An excavation was carried out 16–30 June 2012 at Barflat on the 5th- to 6th -century palisaded enclosure and associated structures identified during the first phase of trial excavation in 2011 (DES 2011, 27) and previous geophysical survey and aerial photography. The excavation included a large proportion of the interior of the enclosures that surround the Craw Stane (NJ 49749 26345). In the area opened in 2012 linear settings of postholes, plank slots and associated features from at least one large timber building were located. These structural features lay within the two ditched enclosures and the palisade identified in 2011. Further sections were dug across the inner and outer ditches and the palisade to clarify the structural elements of the defended enclosures that surround the Craw Stane. The post and beam settings found near the Craw Stane appear to represent elements of an elaborate entrance structure to the fort. Clear evidence for the use of planks in the palisade construction was detected. The substantial area damaged by cattle in 2005 was also revealed during the excavation, underlining the threats to the site. Artefacts recovered included early medieval metalworking tongs, sherds of imported Late Roman Amphorae (B-ware) of 6th-century date, bronze and iron pins, metalworking moulds for pins and a brooch, glass-working debris and sherds of 6th-century continental glass. 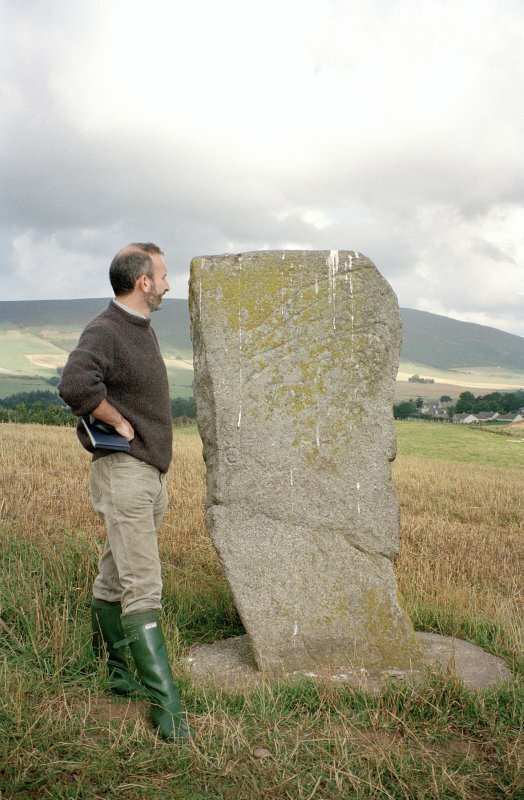 This second phase of evaluative work strongly suggests that the Craw Stane and two other symbol stones (the Rhynie Man and a smaller slab) found downslope from the Craw Stane were associated with a high status, possibly royal site, encompassing settlement and ritual dimensions of the 5–6th century AD. Detailed post-excavation including radiocarbon dating will help to further elucidate the full sequence. Funder: British Academy, University of Aberdeen; University of Chester; Society of Antiquaries of Scotland and Carnegie Trust for the Universities of Scotland. NJ 49933 26490, NJ 4980 2715 and NJ 49749 26345 The ACCORD (Archaeology Community Co-production Of Research Data) Project was an Arts and Humanities Research Council (AHRC) funded research project led by the Digital Design Studio (Glasgow School of Art), with the University of Manchester, RCAHMS and Archaeology Scotland, which worked with 10 community groups across Scotland from October 2013 to March 2015. The project aimed to co-design and co-produce 3D digital data of heritage sites that are of significance to the community groups and which they wished to record. The ACCORD team worked with the Rhynie Woman group based in Rhynie and Huntly, from 29–31 August 2014. 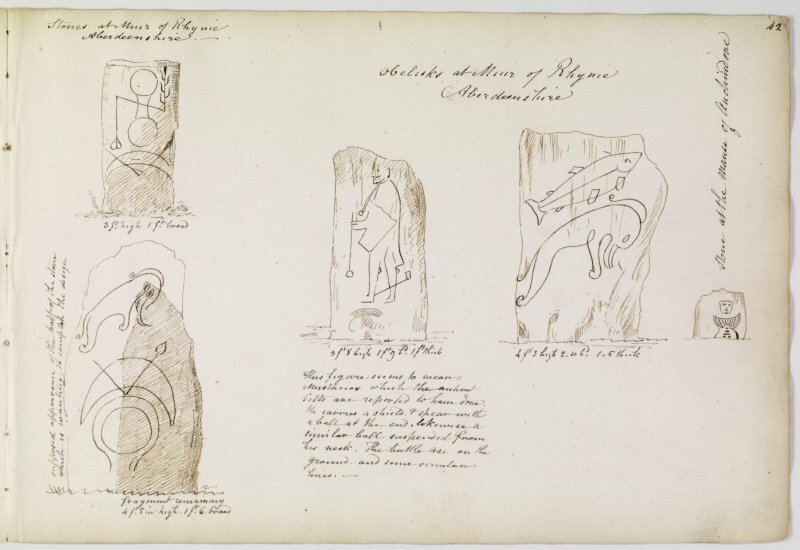 Together we modelled and recorded a standing stone with Pictish symbols known as the ‘Craw Stane’, another Pictish symbol stone in the town square and two headstones in the Rhynie churchyard, one 18th-century and the other 19th- century in date. We used the techniques of photogrammetry and Reflectance Transformation Imaging. NJ 49749 26345 (NJ42NE 35) From 15 August – 3 September 2017 a small 8 x 8m trench was excavated at Barflat, Rhynie. This was targeted over the 5th/6th-century palisaded enclosure and associated structures identified during previous geophysical survey, aerial photography and four seasons of excavation, between 2011 and 2016. The ditched and palisaded enclosures surround the Craw Stane, a Pictish Class I symbol stone that stands in the fields to the S of Rhynie village (NJ 49749 26345). Modern day Rhynie is a rural village in central Aberdeenshire, surrounded by open countryside. It is a picturesque location, and deceptively modest, for archaeological evidence attests to many centuries of high status settlement in the area. Even the name Rhynie itself is regal, deriving from 'Rig' meaning King. 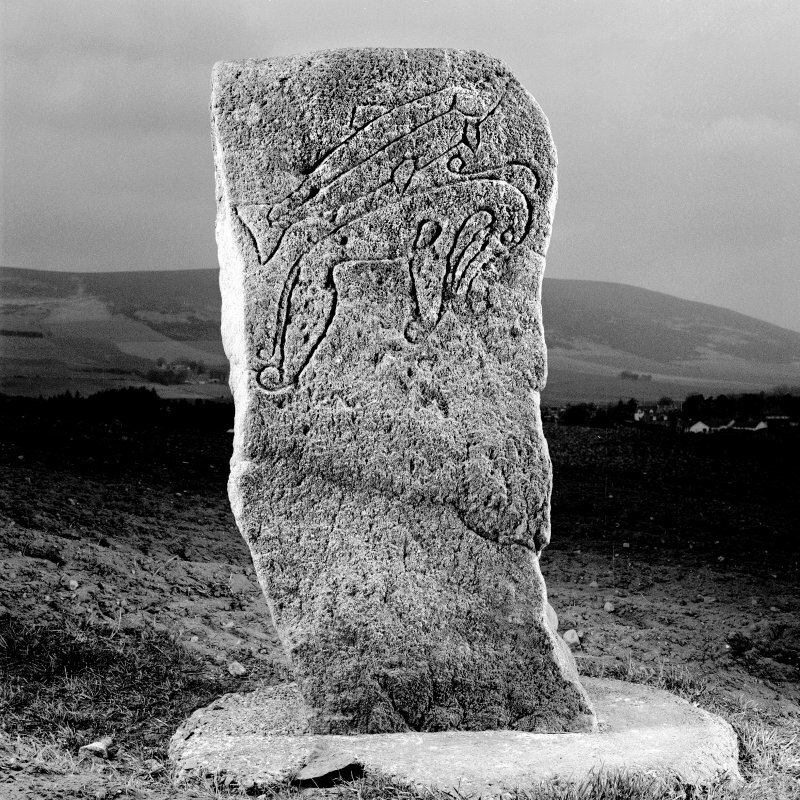 Many Pictish stones have been found here, including the famous 'Rhynie Man', a 6ft high figure carrying an axe, found in a field in 1978. 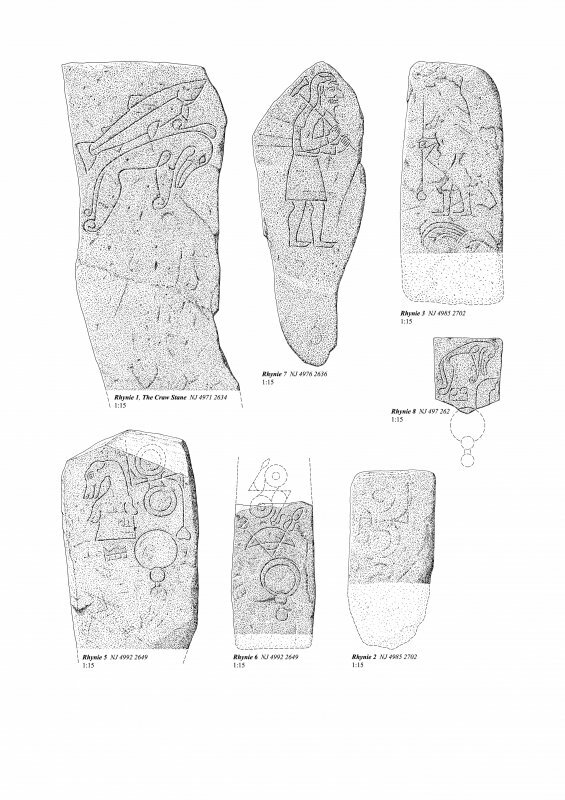 So who were the Picts, and what were they doing at Rhynie? These are the very questions which are currently being investigated by The University of Aberdeen's Northern Picts project. 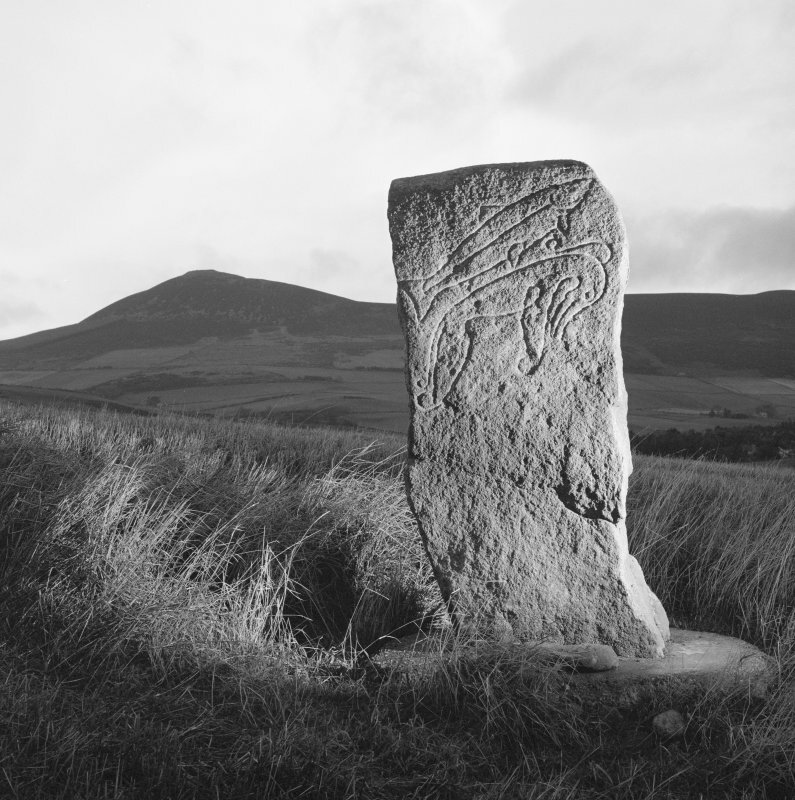 The project aims to find the Picts in the landscape of Northern Scotland, and has had many notable successes in recent years. 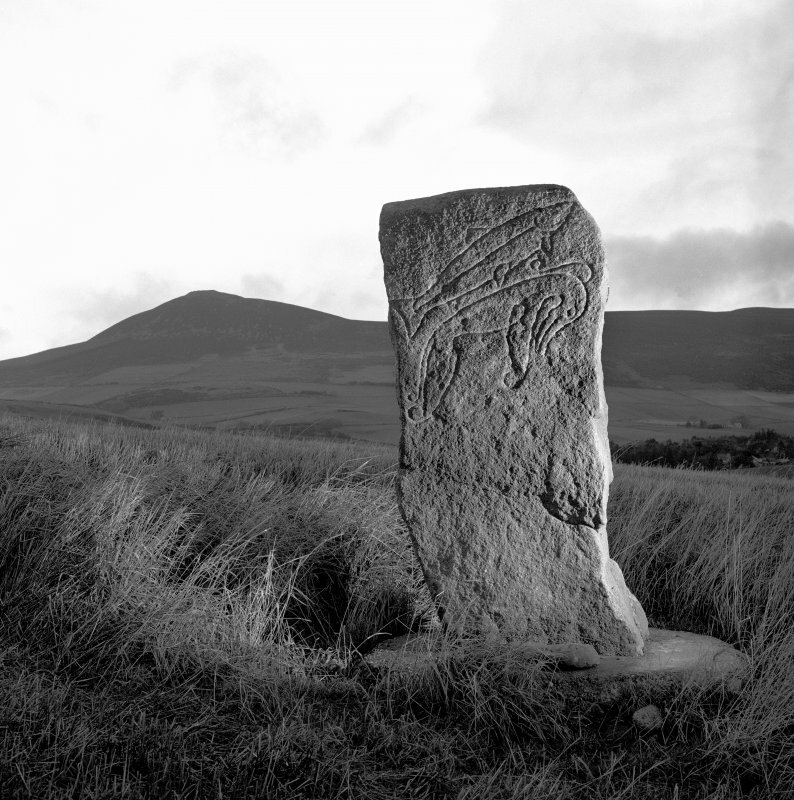 The Rhynie Environs Archaeology Project (REAP) is a key case study within the Northern Picts project. It is a collaborative endeavor between the Universities of Aberdeen, Chester and Glasgow and the local community artist collective Rhynie Woman. Excavations in 2011 and 2012 revealed a series of fortified enclosures near to the the Craw Stane, a Class I Pictish symbol stone which still stands today. This is located at Barflat, northwest of the present day village and very close to where Rhynie Man was found in the 1970s. Early indications were that this was an important settlement. Further work revealed a series of concentric enclosures centred on a ring ditch and other possible timber structures, and in association with the Class I symbol stone. An interpretative reconstruction of the site has recently been completed and it is available to view online. You can access it by clicking on the link below. Settlement evidence for this period is very rare, and the evidence for Pictish buildings which has been found at Rhynie is extremely important. 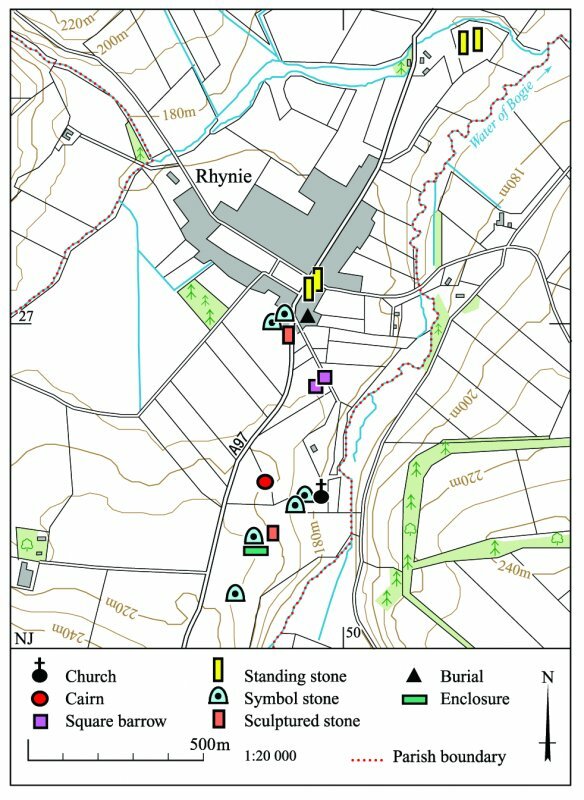 Equally significant is the evidence for large-scale high status metalworking at the site, and a range of Continental imports which have been found here, indicating without doubt that Rhynie was an important power centre dating from the 4th to the 6th centuries AD. A contemporary cemetery has been found closer to the village. The Rhynie Environs Archaeology Project is investigating the interaction between the high status site here and the wider landscape. The complex at Barflat is close to two small fortified sites at Cairnmore and Wheedlemont, and the great hillfort at Tap O'Noth [see previous Archaeology InSites feature under Age of Iron]. 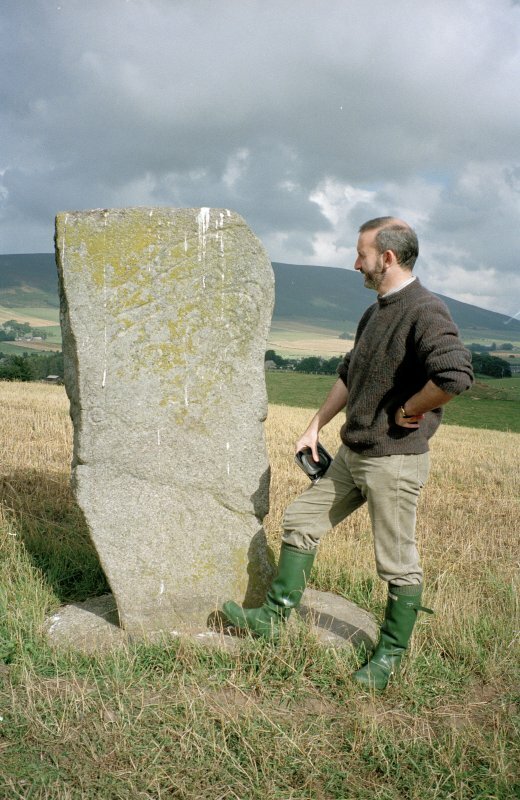 A 5th/6th century phase has been identified at Cairnmore and it is very likely that both Wheedlemont and Tap were in use at this time, but connections between these sites and Rhynie are still to be established. Understanding the links between these sites, and indeed if they are there at all, is key to understanding the development and control of the landscape of the Strathbogie area. Rhynie has yielded a rich assemblage of high status material. One of the most iconic finds from the site is the axe shaped pin which was found in 2012. This pin, with its serpent design, resembles the axe which is carried by Rhynie Man, now in the reception area of Woodhill House, the headquarters of Aberdeenshire Council. The 2016 excavations revealed the best evidence yet for high status metalworking at Rhynie. Over 50 sherds of crucibles were found at the site, and clay moulds were uncovered in greater numbers than at any other known Pictish site. These moulds produced a range of different pins and brooches. There was even evidence for enameling. The finds from the 2016 season are currently undergoing conservation work, and although less visually striking than the finished products, they have the potential to tell us far more.